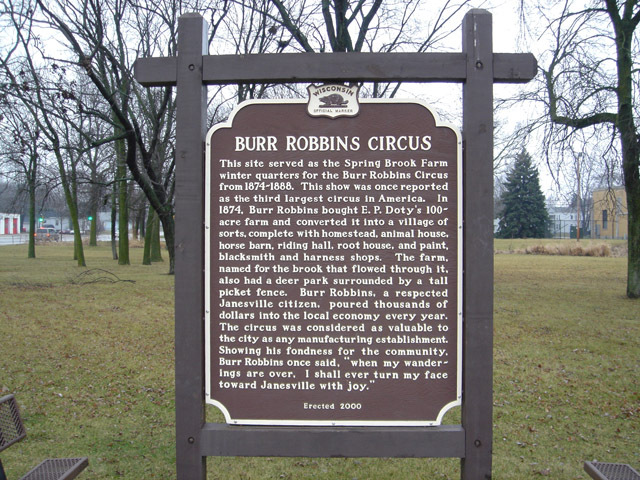 Located North west corner of Delavan Dr. and Beloit Ave. on bike path Coordinates Lat N 42:40':096" Lon W 89:00':748"
This site served as the Spring Brook Farm winter quarters for the Burr Robbins Circus from 1874-1888. This show was once reported as the third largest circus in America. In 1874, Burr Robbins bought E. P. Doty's 100' acre farm and converted it into a village of sorts, complete with homestead, animal house, horse barn, riding hall, root house, and paint, blacksmith and harness shops. The farm, named for the brook that flowed through it, also had a deer park surrounded by a tall picket fence. Burr Robbins, a respected Janesville citizen, poured thousands of dollars into the local economy every year. 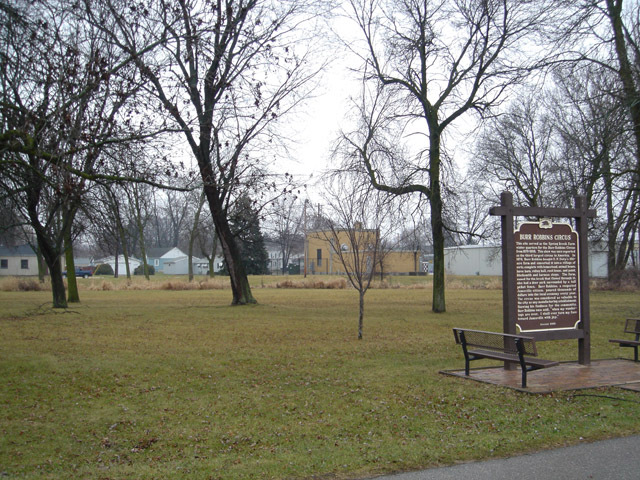 The circus was considered as valuable to the city as any manufacturing establishment. Showing his fondness for the community, Burr Robbins once said, "when my wanderings are over, I shall ever turn my face toward Janesville with joy."